Kings Langley returned to the top of the SSML Premier Division table with a thumping 5-1 victory over Ampthill Town at Gaywood Park on Tuesday night. Nick Jackson seemed keen to eclipse fellow striker’ Mitchell Weiss’ seven minute hat-trick in the previous game with two goals in the opening three minutes, but ultimately had to wait until the 21st minute to complete his second treble of the season. It was Weiss who outstripped the defence on the left and delivered the perfect low cross for Jackson to sweep home after 35 seconds and then replicated the service with a through-ball that enabled the skipper to beat Jordan McKechnie in a one-on-one for his second. Kings extended their lead when a corner was only partially cleared and Jackson seized on the ball on the edge of the box to lash home a low shot, before a dazzling Alex Campana run saw him ghost past four defenders only to be felled as he was about to pull the trigger. Danny Hutchings dispatched the penalty with confidence and, two minutes later, Kings keeper Ant Ladyman was called into action for the first time when he held a shot from Charlie Cullen. Town changed keepers at the break and, to their credit, put in a much improved session that matched Kings for much of the half. Ten minutes in, a teasing right wing run by Campana and a textbook cross to the head of Tom Carter had taken the score to five, but Ampthill kept going. Although Ladyman had to pull off two good saves, he was powerless to prevent Jake Dawson’s consolation header seven minutes from the end, when the Kings defence failed to utilise its height advantage to deal with the substitute. 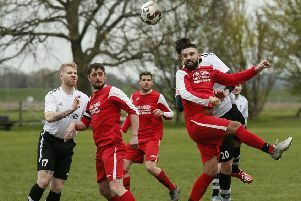 Although their second half performance did not live up to the first, Kings had done enough to return to the top of the table with four games in hand, taken their goal tally to a remarkable 114 and scored five or more in a match for the ninth time this season.